Part of hunting is using your equipment to an edge over your game, whether that means improving your weapons, using new calls or finding new ways to blend into your surroundings. Choosing the right vehicle is just as important. The amphibious and all-terrain capabilities of an Argo let you get to remote hunting areas faster and easier than any other vehicle on the market, giving you an advantage on your game and your fellow hunters. All XTVs are designed to work in temperatures ranging from 40°F to +104°F. They’re able to achieve such a wide range of operating temperatures by using fuel-injected industrial engines and a fully enclosed drive system. The tires are the suspension, so there are no A-arms, anti-roll bars or other components that can get hung up on rocks and branches. 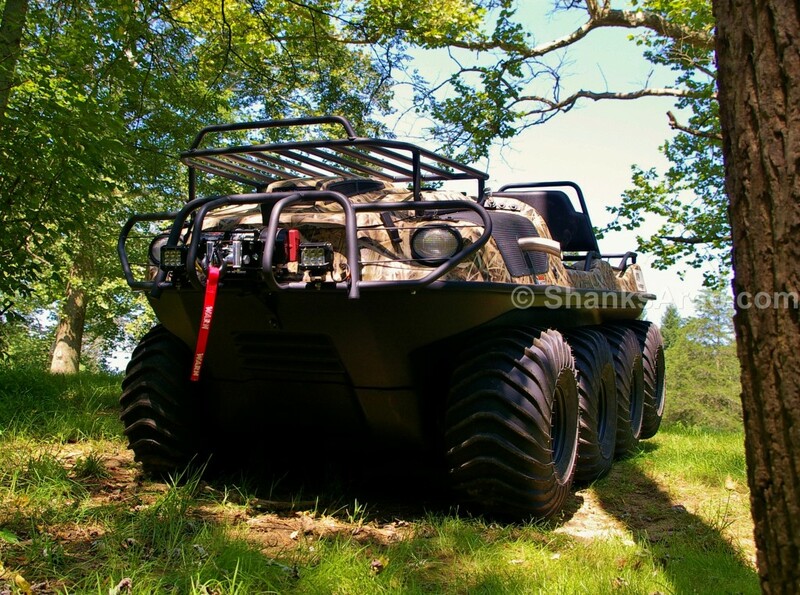 An XTV has the capabilities of a trolling boat, swamp buggy, and UTV, letting you go between different terrain without having to switch vehicles. This lets you get to fishing holes and other areas that are out of reach for traditional vehicles, and you can reach hunting spots faster because you don’t have to drive out of your way to use bridges to cross waterways. Stability is better, too, letting you climb slopes that are too steep for UTVs. Shadow Grass Blades is based on photos of marsh grasses which have been digitally enhanced with lighting and shadows that match the light cast from water reflections. The result is a pattern that blends in perfectly with tall grass and marshes. This makes it perfect for fishing and duck hunting and has been adopted as the official camo of Ducks Unlimited. These XTVs come with a gun rack that mounts in the center of the vehicle behind the front seats. This keeps rifles dry without having to store them in a case. The rack holds four rifles or two bows, and the center can be removed when not in use for more storage space. A 3,500 lb. Warn winch can pull the XTV out of ruts and rescue equipment and other vehicles. A front-mounted track adds extra cargo space, while floodlights on the front end help you find game and let you light up the area when you’re setting up camp. The Huntmaster Series includes Frontier 6×6, Frontier 8×8, Avenger, and Conquest models, letting you get the right balance between size, cargo capacity, and price. — Adding an outboard motor mount lets you use a sub-10hp boat motor for faster water travel. — For extremely rough terrain, Argo offers beadlock rims, keeping the tires attached at low air pressure for better grip. — Want to hunt in remote areas? All XTVs can be set up for transport using a helicopter sling, and carriers can be added to the back to carry extra fuel or a spare tire. — Need to carry extra equipment or haul big game? Argo makes amphibious trailers that can go anywhere their XTVs can go. Whether you’re looking for an XTV or you need parts or service for your Argo, go with the dealer with over thirty years of outdoor equipment experience. Shank’s Argo is one of the largest dealers in the Eastern U.S, so we have the support you need to get the most out of your amphibious ATV. Visit our shop at 4900 Molly Pitcher Highway in Chambersburg, PA, or visit www.shanksargo.com.